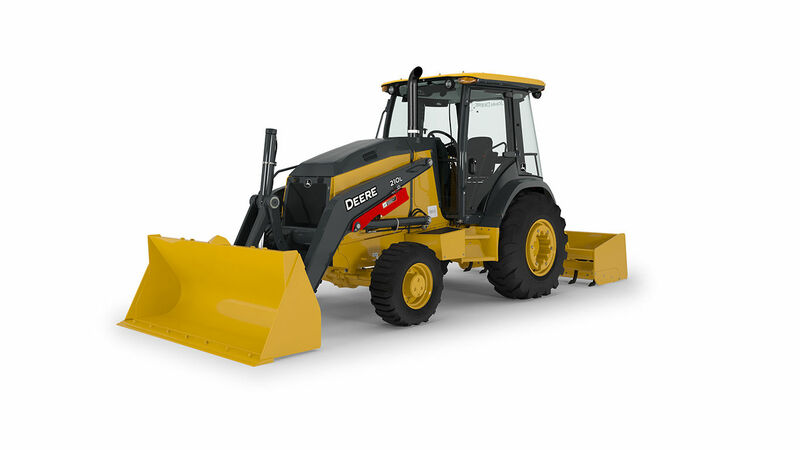 Mechanical-front-wheel drive (MFWD) and differential lock can be engaged on-the-go to give extra traction in poor underfoot conditions or for moving heavy loads. Optional limited-slip front axle delivers 65 percent of available power to the tire with the best traction. For true all-wheel-drive pulling power. Rugged FT4/Stage IV PowerTech™ Plus diesel engine employs cooled exhaust gas recirculation and selective catalytic reduction system. No diesel particulate filter (DPF) is needed on either model, reducing downtime and expense. Variable-speed electronically controlled fan on the 210L automatically speeds up or slows down, operating only as needed to keep things cool. Helps conserve power and fuel, while reducing noise. Standard economy mode helps maximize fuel usage in lighter-work applications with minimal effect on machine performance. With ride control activated, front loader hydraulic cylinders act as a shock absorber, smoothing travel over rough terrain, helping full loads reach their destination, and reducing operator fatigue. New hitch design makes it easier to position the box blade over the pile for more versatility and productivity. Integral three-point hitch accommodates a variety of tools. Choose cab or open operator station. Two-position tilt hood provides same-side ground-level access to engine and transmission dipsticks, engine-oil fill, fuel and air filters, and coolant reservoir. Fuel fill is also closely convenient.